The YMB Automatic Cyclic pump is widely used for machines requiring periodic or timed lubrication. Two different discharge volumes and six different cycle time models are available. The YMB comes standard with a 2 liter plastic reservoir. Discharge volume can be adjusted simply by replacing an E-Ring to the slot of desired discharge position. An optional float switch is available. 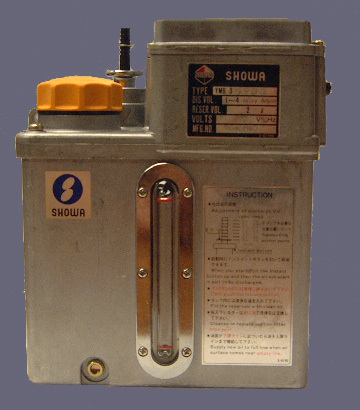 If you require a more Heavy-Duty pump take a look at the Showa YMAS. More economical models are also available in the Showa SSMA, SMD and SMA.